My first foray into writing came when I wrote a poem at 7.
draw anything with straight lines, like churches or other imposing buildings. Favourite authors at that time were Enid Blyton and I had every book of Agatha Christie on my shelf. My mother used to moan when I was madly scribbling all my thoughts down before I forgot anything. ‘Get outside and do something healthy.’ she used to quip, trying to push me out the door. My two English teachers said I should go into journalism, an idea I toyed with. I wrote and read in equal measure. In reading, it felt as though I had an insatiable appetite for the thrilling escapism and amazing journeys of all sorts of books, whether fact or fiction. And writing became my own journey into the lives of my characters and their situations. I love writing children’s books; I love writing, full stop; I also love the research of both articles and fiction. My work has been critiqued, articles have been accepted for magazines and local newspapers, my children’s books have been self-published. 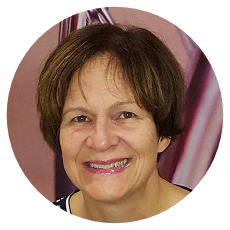 In 2017 I did two fantastic weekend courses at West Dene College for Arts – Crime Writing with Elly Griffiths and Lesley Thomson and Character & Perspective in Fiction with Isabel Ashdown – each of these successful authors were incredibly inspiring and uplifting and taught me a lot. I always seek to improve my skills and I read lots of different genres. 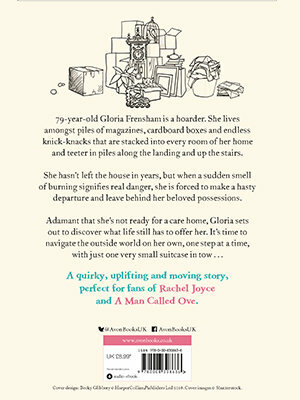 Below is my debut adult novel:- The Woman Who Kept Everything, published by Avon Books UK, Harper Collins. Underneath are my 6 children's books. 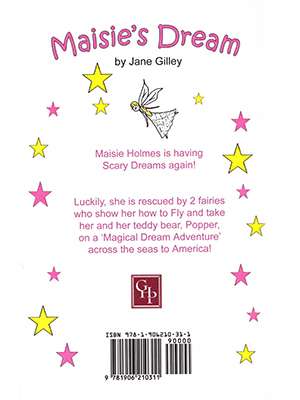 In 2008, I had a book signing at Waterstones in Jersey, with Maisie's Dream. 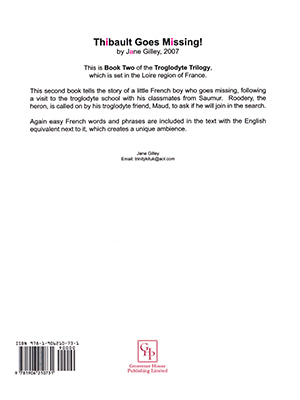 The Troglodyte Trilogy: These books are set in the Loire region of France, near the Loir River. Easy French words and phrases are included in the text with the English equivalent next to them, to create a unique ambience. It was a hot windy summer's day on Troglodyte Hill and it was a special day because it was Roodery, the heron's, birthday. Roodery and Snap, the mouse, Whisper, the ant and Feather, the blackbird were best friends. “I like birthdays!” squeaked Snap, twirling her tail. “But isn't it funny how everyone has different birthdays?” said Whisper, as loudly as possible, so his friends could hear him. “We have really brilliant birthdays on Troglodyte Hill!” said Feather. Roodery's birthday part was going to be held under the old, oak tree in Stream Valley at the bottom of Troglodyte Hill. This first book centres around Roodery, the heron's, birthday which is interrupted when there is a fire on the hillside. The fire threatens to set the whole of Troglodyte Hill alight! So Roodery and his friends, Snap, Whisper and Feather have to think of a way to alert the troglodytes (cave dwellers) to help put out the fire. 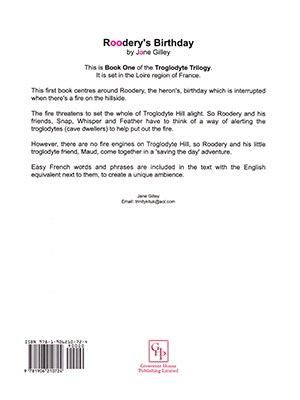 However, there are no fire engines on Troglodyte Hill, so Roodery and his little friends, as well as his troglodyte friend, Maud, come together to save the day. One day a big green bus ambled up the hill to Troglodyte Village in the River Loir region of France. It's engine churned noisily and it backfired with a loud BANG because it was quite steep in places. Finally it stopped outside the cave school where the troglodyte children were having arithmetic lessons. This second book tells the story of a little French boy who goes missing, following a visit to the troglodyte school with his classmates from Saumur. Roodery, the heron, is called on by his troglodyte friend, Maud, to join in the search. It was a cold wintry night, two days before Christmas and the stars twinkled like diamonds in the sky over Troglodyte Hill in the River Loir region of France. Maud snuggled into her eiderdown and wondered if her bird friends, Roodery, the grey heron and Feather, the blackbird were warm too! Of course, birds had feathers to keep them warm and all the other little creatures on Troglodyte Hill had burrows and nests or holes in the ground to keep themselves warm when it was cold. As Maud turned over to sleep she remembered the past year on Troglodyte Hill. First, there was the fire that Roodery and Feather had warned the village about. And then there was the visit of the school children from Saumur when little Thibault got lost and, yet again, Roodery and Feather saved the day when they found him in Monsieur Didot's barn, playing on the big red tractor. The final book tells the story of Maud's 'Big Surprise' for Roodery, the heron, and his friends in time for Christmas! 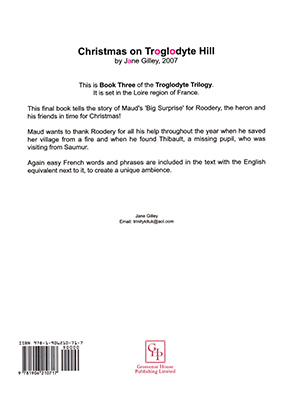 Maud wants to thank Roodery for all his help throughout the year, when he saved her village from a fire and when he found Thibault, the missing schoolboy, who was visiting from Saumur. Sony Polly and Georgie Porgy were two inquisitive Senegal parrots. They lived on the island of Jersey. 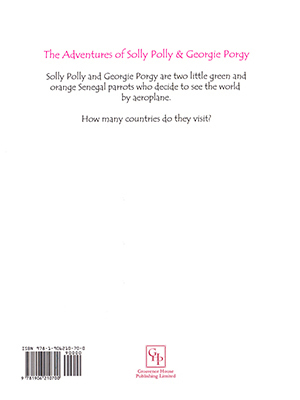 Solly Polly and Georgie Porgy are two little green and orange Senegal parrots who decide to see the world by aeroplane. How many countries do they visit? "Do you see that big Ca, Ca, Cat over there?" said Pod the jackdaw to Tippety the mouse. "In that eucalyptus tree - it's big paw hanging da, da, down!" "Oh My! I really must dash!" Tippety exclaimed and tippety-toed off, as fast as her four tiny feet would carry her. 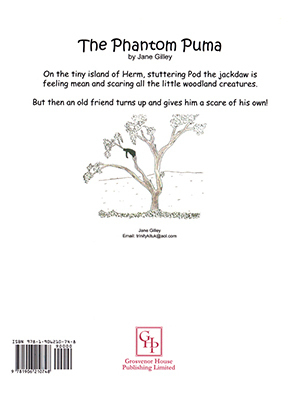 On the tiny island of Herm, stuttering Pod the jackdaw is feeling mean and scaring all the little woodland creatures. But then an old friend turns up and gives him a scare of his own! Maisie Holmes was having scary dreams again. One night she dreamed monsters were chasing her through a dark forest! She didn't know where she was. Twigs snagged on her hair as she ran through the twisting undergrowth. Then ahead of her in a clearing, Maisie spied a little cottage and ran towards it. Whose house was it? She didn't know. She ran down the garden path, hoping she would be safe if she could just get inside. She tried the door latch but it wouldn't budge. So she started knocking. Maisie Holmes is having scary dreams again! Maisie's dreams, which start off as nightmares, are the result of her missing her father, who is establishing a new office for his company in America. Maisie's mother, who feels she cannot deal with Maisie's problems on her own, enlists the help of a psychiatrist (who does not help at all) as well as a sleep specialist – smiley Miss Ridgeley (who goes away on holiday when she is needed most). However, in Maisie's dreams she meets 2 fairy beings who help her come to terms with her father's absence in a magical dream adventure, which finally brings him home to them.